Dan Marino had a cannon arm and carried the Dolphins for nearly two decades. Despite never having a breakout running back or a Hall of Fame caliber wide receiver, Dapper Dan possessed virtually every major passing record (21) when he retired following the 1999 campaign. This [size] “50” Wilson jersey was worn by the Hall of Famer during the 1995 season. Throughout the 1995 regular season, Marino threw 3,668 yards, which included 24 touchdowns. Despite falling to 9–7 and to third place in the AFC East, the Dolphins again advanced to the playoffs because they placed sixth in the AFC. The game the jersey was attributed to was a Monday Night game against the 49ers on November 20, 1995. In the game, Marino matched the career record he coveted most – Tarkenton’s 342 touchdown passes – San Francisco led 38-13. The record-tying pass was a 4-yarder to O.J. McDuffie late in the third quarter. Marino earlier threw a 42-yard touchdown pass to Gary Clark. 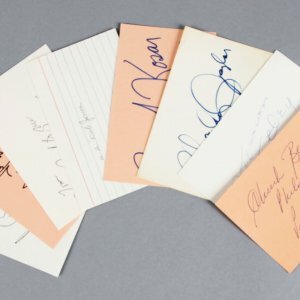 Marino, who broke Tarkenton’s records for passing yardage and completions earlier this year in games Miami lost, completed 23 of 38 passes for 255 yards. The Dolphins lost this one 44-20 by it was a record tying game for “Dan the Man”. The aqua green Miami Dolphins jersey sports a Wilson tag in the collar with the [size] 50 and a year  swatch. The front has his iconic number “13” sewn on in white and orange tackle twill. 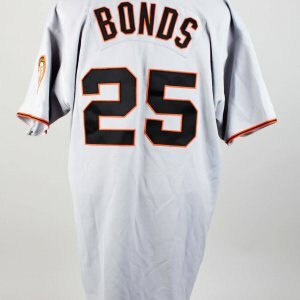 The verso has the same orange/white tackle-twill numbering along with “MARINO” sewn on a nameplate. Both torso sides have stretch spandex for fit. On each sleeve, striping and Dolphins emblems are screened on to help this beauty stand out. Marino also customized the right sleeve by cutting the end seam of his right shoulder (under arm pad area) for optimal throwing. Moderate use via light remnants of soiling/hit marks are displayed on the two-color teal-on-orange tackle twill identifiers. The inner side gusset is affixed with a Wilson wash instruction tag. It must be mentioned that this jersey is unique in that it is missing a Wilson logo on the sleeve. For some unknown reason, Marino did not have one in this particular game hence the attribution (also based on original provenance). See Getty images 51993389 & 51993390 in reference to this unique feature which ties into this particular Monday night game against the 49ers. 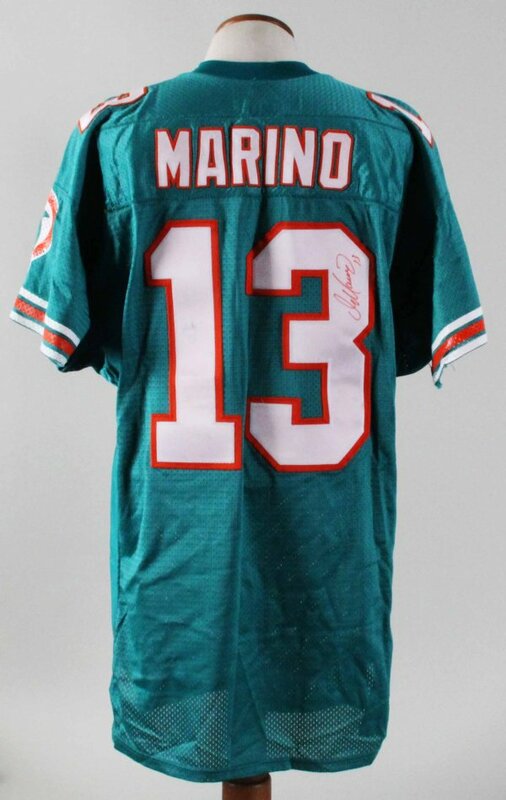 The jersey was autographed in red felt tip for added measure on the back number by Marino (“9”). During his gridiron tenure, Dan Marino set the standard for quarterback play. This Marino gamer sets the standard higher when it comes to Hall of Fame worthy collections.